That's an exaggeration. The gap is only slightly larger than the early 20th Century gap. Carbon 14 levels have been DECLINING in the 20th Century, so you are being hypocritical when you call me an idiot. In addition, we have Beryllium 10 isotopes that pretty much confirm what the decline in Carbon 14 isotopes tell us, that solar activity ramped up strongly during the 20th Century. Read the Usoskin et. al paper I posted. One side effect of the change in atmospheric carbon-14 is that this has enabled some options for determining the birth year of an individual, in particular, the amount of carbon-14 in tooth enamel, or the carbon-14 concentration in the lens of the eye. Still it makes carbon 14 useless for your purpose after the mid 40s, I wonder if nuclear tests affect Beryllium 10 isotopes? There are plenty of solar physicists who disagree with the IPCC. So your evidence is a blog that's so badly designed it hurts the eyes and has as its catch line; "OUR STRINGY UNIVERSE FROM A CONSERVATIVE VIEWPOINT" aren't you a bit embarrassed linking that? Perhaps C-14 isotopes are useless for the mid to late-20th Century. Thanks for linking that up. I don't think Be-10 isotopes would be impacted by it though, which show an even steeper decline in concentration over the 20th Century than the C-14 isotopes in the Usoskin et. al paper. The point of the matter is that we have many lines of evidence that point to a rapidly brightening sun over the 20th Century, including the Geomagnetic AA Index, GCRs, Be-10 isotopes etc. so your statement about how solar activity could not have possibly risen during the time of the industrial revolution seems a bit on the unscientific side, don't you think? BTW are you going to address the fact that the role of the sun in the IPCC was determined by one solar scientist who agreed with herself or not? There is a slight gap between the AA Index and temperatures in the early 20th Century. No, climate is not my field of study, but the basic science is the same and some of my experience is also directly useful in the understanding. I am better versed than many of the other non-climate scientists I have had the opportunity to speak with on the subject. I first became aware of the increasing CO2 levels when I helped my son with a school science project. He wasnted to see if the concentration was different in the city and country where there was more vegetation. The levels did not match my CRC Handbooks for concentrations in ambient air by a large amount. I was worried our analysis was somehoe skewed and did some research. I then found the increasing levels were documented but the proportion charts had not been corrected. That was in the mid 1990s and I have studied the situation ever since. Yes there is. There is a lot of evidence correlating temperature and CO2 increases throughout history. The fact we can increase the CO2 concentration to create a forcing is another bit of evidence to the unnatural nature of the situation. 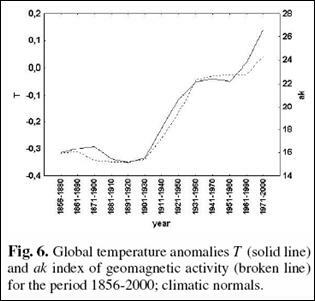 It indicates that part of the warming is anthropogenic. It does not tell us how big this part of the warming is, and if it is the dominant factor or not. Solar activity as in solar output? References? There is also another paper that documents that the level of solar activity we are currently witnessing is one of the highest observed over the last 11000 years. As I stated, there is LESS evidence of the hypothesis you claim is more probable. No, there is evidence that such a mechanism exists. It is how large the effect is that is under question. Why? The geomagnetic flux theory does not claim increased radiance as the effect does it? Your claim that work about the geomagnetic aa index did not get many citations was not correct. No, I said the geomagnetic flux theory did not get much attention. The theory being the cause of the warming trend. I thought the discussion was fairly clear context wise. Yes and their focus was on irradiance correlation not cause and effect, which is not the same hypothesis. Didn't the CERN experiments already show this effect, which also showed the nuclei were too few and too small to have the impact observed in the atmosphere? As I said, there is LESS evidence of the hypothesis you claim is more probable. See, real science is more interesting then blog science. I will tell you what is scientific I don't know enough about the Geomagnetic AA index GCRs BE-10 isotopes to comment I would have to spend time learning about them to give a sensible response however I don't take your claims that they prove something at face value, the fact you cited changes carbon 14 as proof of something shows that not taking your claims at face value might be wise. Last edited by spot1234 on Wed Jul 04, 2012 12:51 pm, edited 1 time in total. So can we say you know your S**t? I had a job dealing with garbage as well, no papers were published a result though. You did not have to be very smart but I will tell you what; you don't need to go to the gym. A bit, yes. I follow the idea of an expert as being one who knows that there is much he does not know. One of my "favorite" PhDs just publicly claimed in an email committee discussion of industry experts and governmental regulators that I did not know of which I spoke. He likes to use his degree as a club to get his way, but my experience and doing my homework makes it difficult for him as I ignore his club and deal with the facts. Shortly there after he wished to discuss the matter privately in order to admit his error. Some of the other committee members had already contacted me to inquire my recommendations for how they could implement my suggestions.